It's my day off today so I have to use my time wisely and hopefully catch some fish to replenish my supply which has been diminishing. I made the kids a couple of breakfast sandwiches and off they went to school. I decided to go a little further than my local fishing hole today so it was time to refuel the boat. After getting gas I was ready to go by about 8:30am. Debbie told me that she ran into a guy who was already out fishing this morning and he said not to bother because of the cold and wind. I knew that the forecast was better for later in the day so I that's why I skipped the sunrise today. I made about a 40 minute run out to Raritan Bay at the very end of low tide. Despite the earlier warnings, it was a really calm day and I'm glad I made the choice to go. 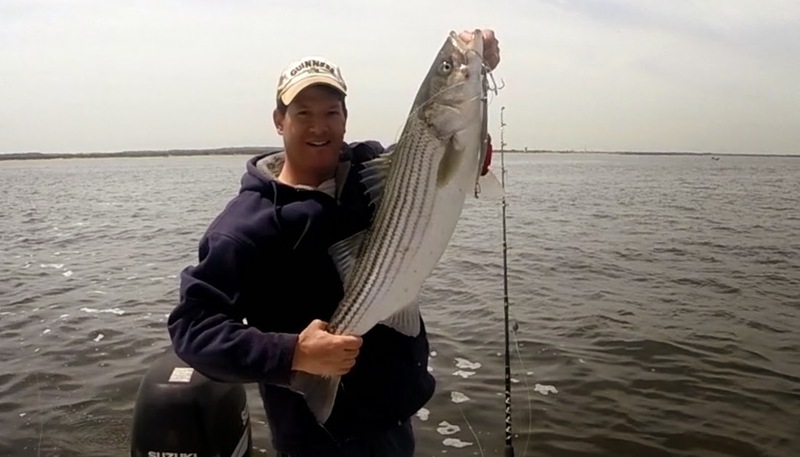 My plan for today was to troll big bunker spoons and although I despise trolling, it is a proven method to catch big striped bass this time of year. I only had one spoon so I put it out there and began cruising around looking for signs of life. There were other boats out there doing similar things but I didn't see anyone hooking up. Well, my line had only been in the water about 5 minutes when all of a sudden it gets hit! The drag started pulling line off the reel and I was very excited to be hooked up already. Alas, as quickly as this fish hit, he popped off. Still, it was an excellent sign to know that I was in the right spot doing the right thing. After a few more minutes went by, Bam - hit again. And off again! What was going on? Usually when a fish hits one of these bunker spoons he is on for good. But that was already two misses. Some time went by but eventually I got bit again and I thought for sure this was going to be a catch. I reeled it in thinking I had a fish the whole time but when it got close to the boat all that was there was my spoon. Something had to be wrong here. I reeled he spoon all the way up for inspection. Wouldn't you know it - but the big treble hook that usually hangs off the back of the spoon had been broken off. That explains a lot! At least I didn't lose my spoon all together. I scrambled around looking for another suitable treble hook. Yes! I found one and I was able to modify it a bit to fit onto the back of my spoon. Before I was ready to start trolling again I decided to try a new location that has been productive in the past. It took about 10 minutes to motor to this area. I set out my line and I was ready for a big one. Well, after about an hour of trolling around for miles, not a single bite. Very frustrating. I was so sure there would be fish here. I felt stupid for leaving the spot that I had three bites earlier so I brought in my line and motored back to where I started. By now there were many other boats in this area. I put the line out and started trolling again. It took some time but after about 20 minutes - Bam, my spoon got hit. This time it was on! I continued to feel the fish fighting as I was reeling in this time - no doubt about it, this fish was hooked well. It's a little chaotic trying to troll, fight a fish, get the net and take photos and video all at the same time. I got it done though. 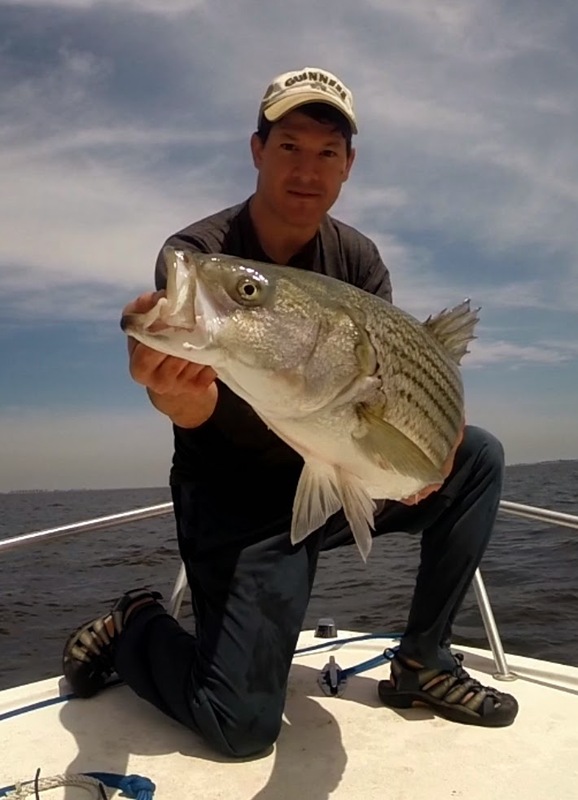 I landed my biggest fish of the season - a 36 inch, 20 pound striped bass. Fantastic! After this catch, the wind started to pick up and I didn't get another bite after trying for another half hour. Content with my one fish, I headed back home before the water got too rough. It was a great trip overall and this fish will help me to restock my supply for at least a week. I got home around 2pm and with the help of one William Buckman, we got the fish into an ice bath where it will sit for a day until I am ready to clean it. Lunch was a delightful honey glazed fish with asparagus and rice and for dinner, you guessed it, the same thing. Hey - at least I'm enjoying it right?